An unplanned pregnancy can be a tough time filled with confusion and uncertainty. Your thoughts may be racing; you may feel scared and overwhelmed. Adoption Makes Family is here to listen, help and counsel you so that you make the best decisions for your future. Treat you with sensitivity and respect. 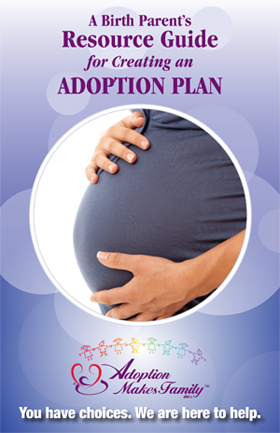 Help you create a loving adoption plan that will focus on your wishes and dreams for the future of your child. Share adoptive family profiles with you so that you may assist in selecting the family to love and parent your child. Allow you to choose a closed or an open adoption. If you choose a closed adoption, we will protect your anonymity. If you choose an open adoption, we will connect you with the adoptive family before the baby is born and we will help you communicate with the adoptive family by mail, telephone or in person after the baby’s birth. You are not alone. We are here to help you at any point along your journey. You may chat live with an adoption counselor – look for the chat button at the bottom right of your screen or for the text button at the upper left of your screen. Do you have questions? You can view and download our Birth Parent’s Resource guide. Our Birth Parent Resource guide is designed to answer many of your questions. You can learn more about deciding if adoption is an option for you. You can learn about the process of creating an adoption plan, Open versus Closed adoptions, adoption laws, and the special way that Adoption Makes Family works with you to create an adoption plan. You are still welcome to call, text or email Adoption Makes Family with any of your questions.